everything seasoning + everything baked chicken! 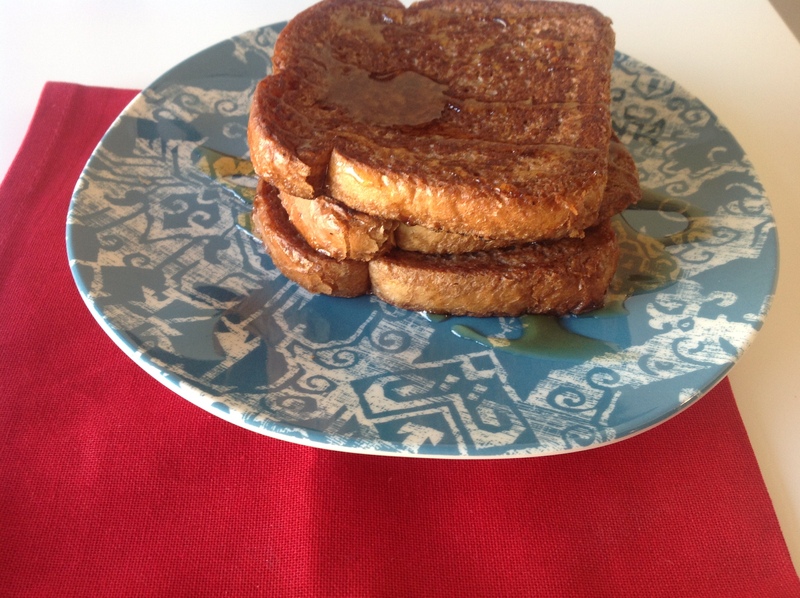 Do you ever just wake up and want french toast? I woke up the other morning feeling like I needed french toast. 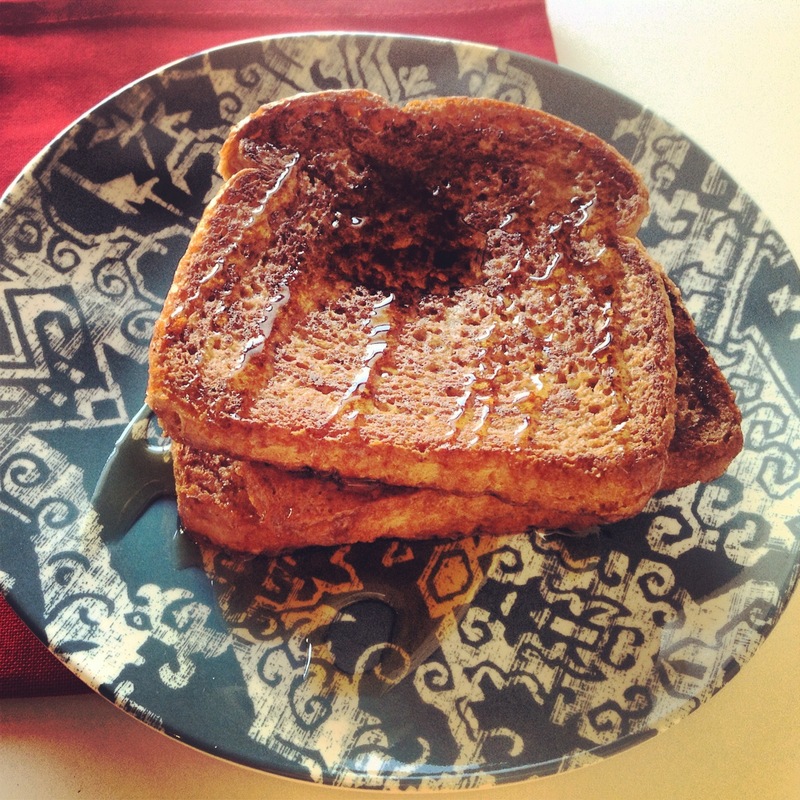 I feel like all I’ve been seeing across the internet lately is pumpkin french toast. Of course my lovely Seattle CityTarget was out of pumpkin pie spice when I was looking for it, so pumpkin french toast was not an option for me. I was laying in bed, lounging around, and because it was a Sunday I really wanted to make myself breakfast. 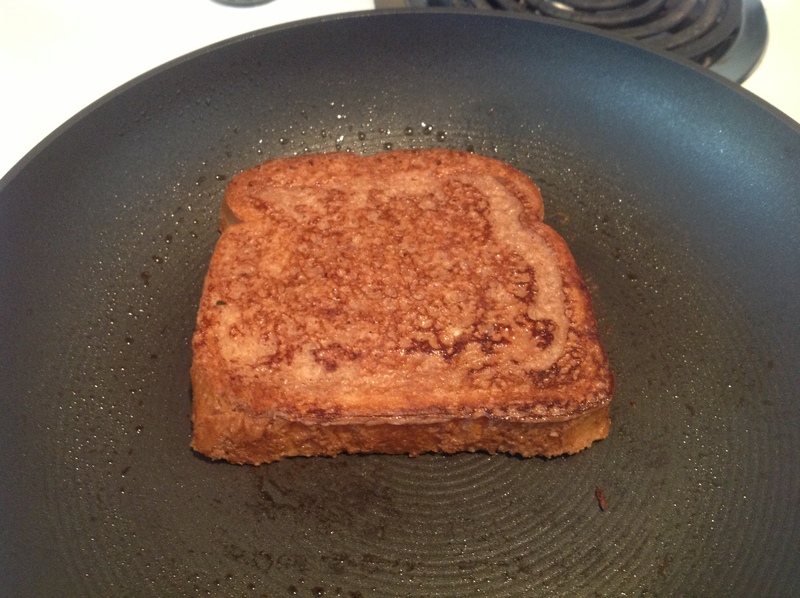 Now, I easily could have made myself normal french toast… but that was not nearly as fun as the idea I had: Nutella french toast. I originally became obsessed with Nutella when I was studying abroad in Italy. Honestly, Nutella and pretzels is, like, the best combination. Figuring out how to make Nutella cookies was probably my greatest accomplishment abroad, you know, since all the ingredients at the grocery store were in Italian and our “oven” was really a toaster oven. However, it was this Sunday morning that I realized my obsession had reached new heights… in a good way, of course. I have to tell you, the Nutella really creates the perfect combination of chocolatey-hazelnut and cinnamon in this breakfast. I’m drooling over here in Oregon just thinking about it. 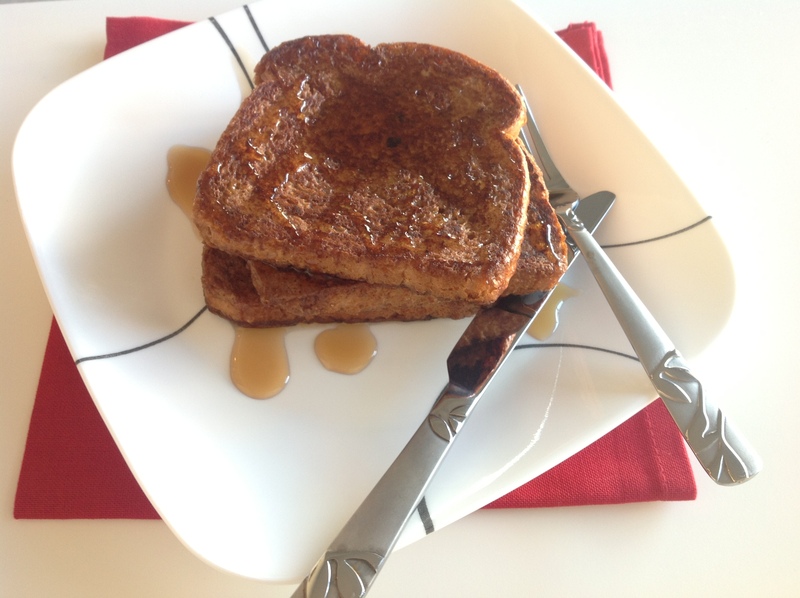 Its definitely worth a try, especially if you’re out of pumpkin spice and can’t make pumpkin french toast! As you can see in the pictures, I ate mine with maple syrup… but I just had a genius idea that might have me making this again when I’m back in Seattle… why not top it with… Nutella! Anyone? Hmm? I guess that might be too much Nutella, but can you ever really have too much? I’m voting for no on that one. Who’s with me? Whisk together the egg, milk, and ground cinnamon. Add in the Nutella and whisk until the mixture is thoroughly mixed and turns a coco brown. Set the mixture aside. Mist a frying pan or griddle with cooking spray and bring to medium heat. Quickly dip each side of a piece of bread into the egg mixture and place on the frying pan. 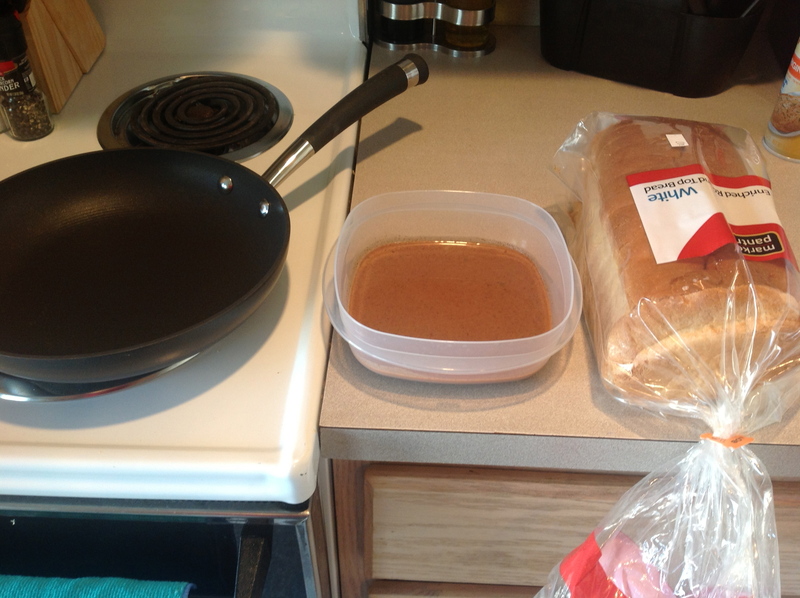 Repeat until the pan is full and allow the bread to cook for 1-2 minutes (or until the bottom starts to brown). Flip the bread and allow to cook for 1-2 minutes on the other side. I ate mine with maple syrup, but you could eat it with whipped cream or ice cream! Let me know what toppings you try! So, one of my bosses went on vacation to Hawaii a couple weeks ago. I wish that had anything to do with the dish I’m about to share with you, but, aside from the name, it doesn’t (I just thought it would be a good transition). 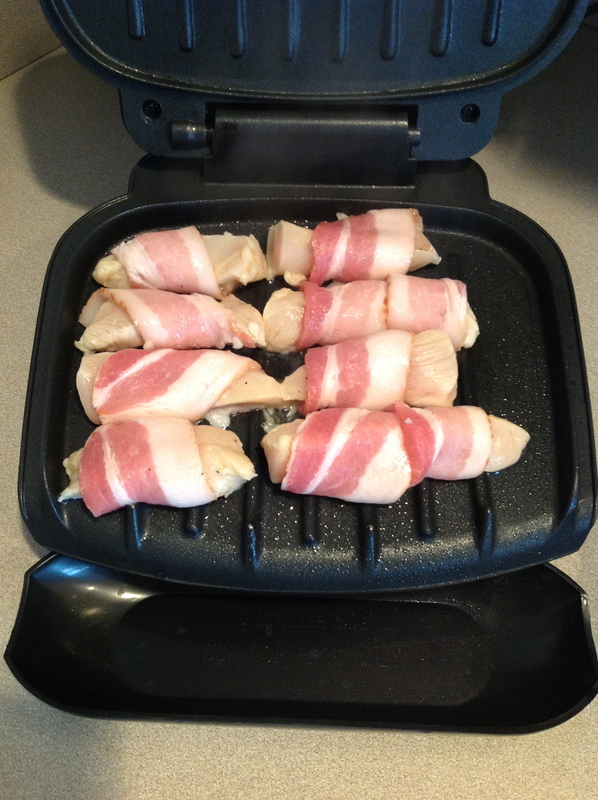 Anyway, I was moseying my way around Pinterest the other night, while I was trying to meal plan, and I came across an image of chicken wrapped in bacon… BACON. *Side note: I just looked it up and “moseying” is an actual word with an actual definition… I thought for sure I was making that spelling up. * But, seriously? I’ll eat just about anything with bacon on it. From that moment on, I was on a mission. I needed chicken with bacon. 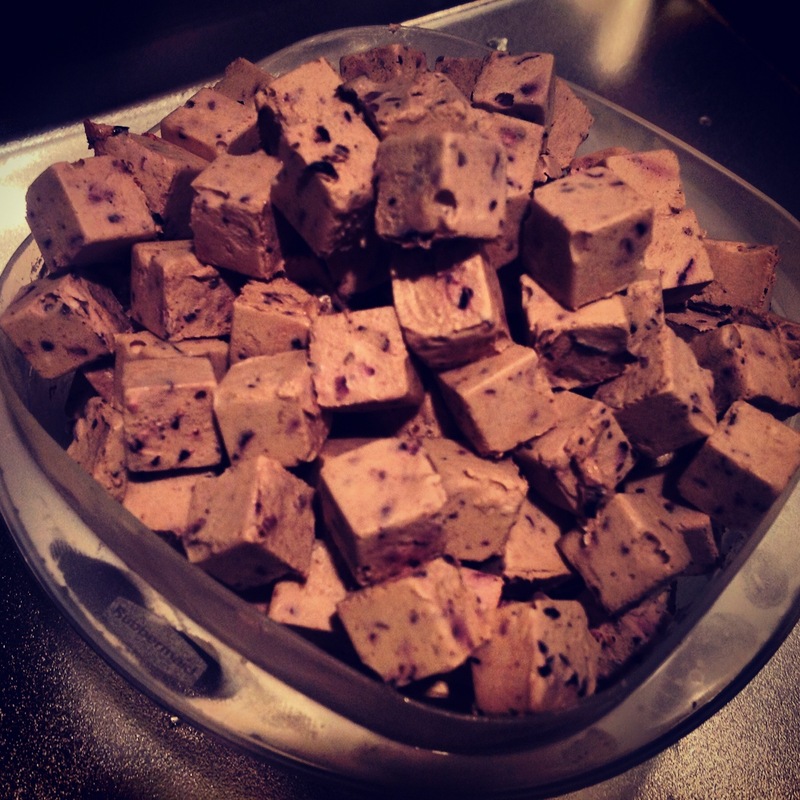 The recipe I had pinned looked DELISH; but, I really wasn’t feeling the whole brown sugar aspect for some reason. Then I had a moment. It was like one of those moments where everything in the world becomes clear to you, except with food. Boy, did I understand food at that moment. You read that correctly: pineapple. 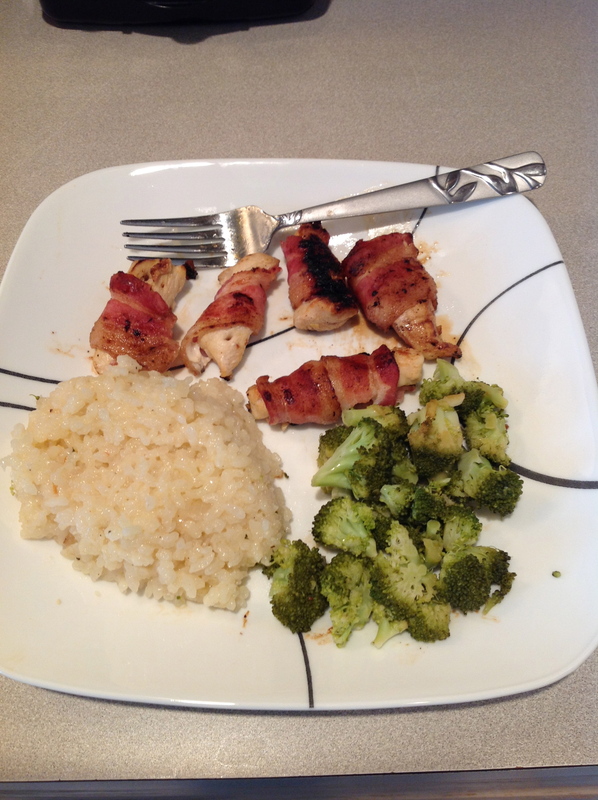 Pineapple soaked chicken, wrapped in bacon… just kill me now. I don’t know who I thought I was at that moment, but I’m almost positive I decided the flavors would be acceptable together because of Hawaiian pizza. I mean it sort of makes sense, right? Hawaiian pizza has ham and pineapple together… bacon is close to ham. Whatever, in the end all that matters is: it worked. It really worked, as in, I could eat it every day for a year, kind of worked. The nice thing about this recipe is that you could totally turn it into a bunch of different things. I ate mine plain for dinner and then for lunch the next day I cooked down some extra pineapple juice and put the chicken in a lettuce wrap with bean sprouts. I made mine with a baked lemon broccoli risotto and a side of broccoli on its own . Also, I cut my chicken into smaller, bite-size, pieces and let it marinade overnight; but I’m sure you could do it in a few hours too. Cut each chicken breast into thirds, or fourths if you prefer thinner chicken, and place in zip-lock bag with lemon and pineapple juice. Roughly mince the clove of garlic and add to the bag. Allow chicken to marinade at least two hours (I let mine marinade overnight). 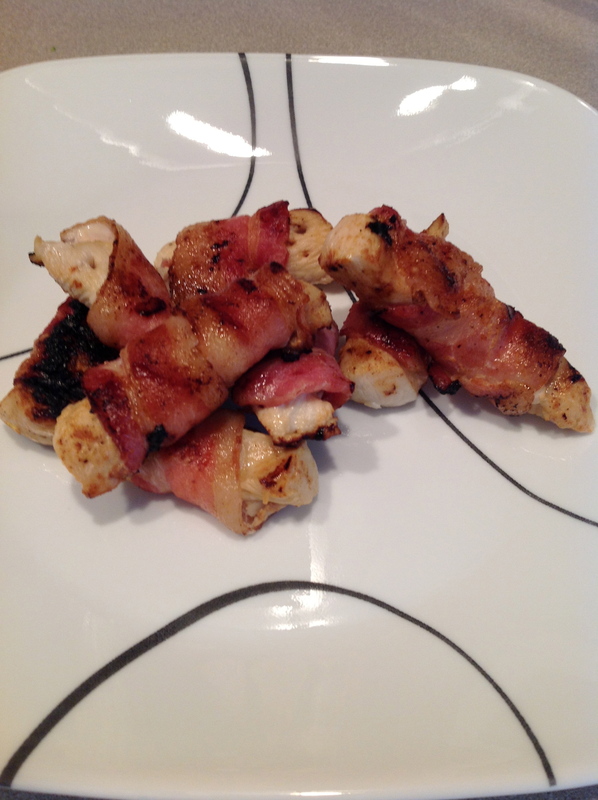 Remove chicken from bag and wrap a bacon slice around each piece. 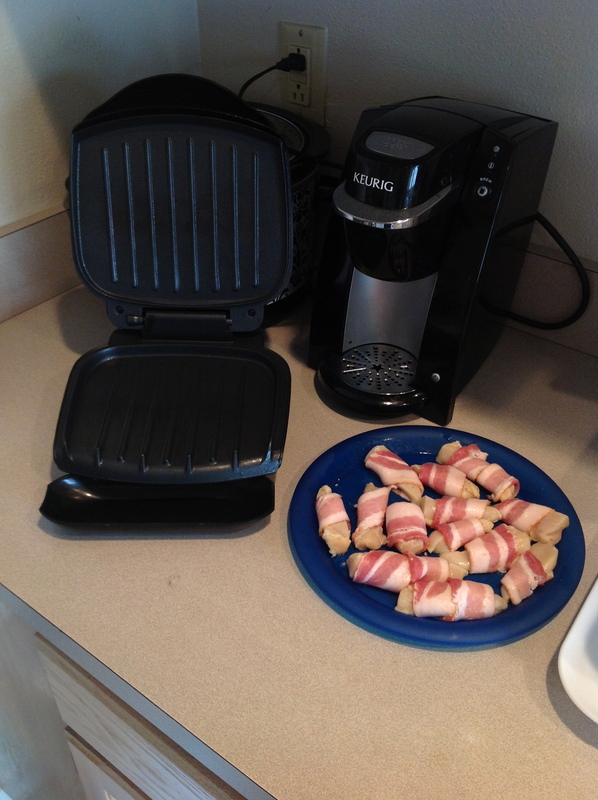 Grill for approximately 15-20 minutes, until chicken is fully cooked and bacon is crispy. Please, don’t run away from your computer, screaming, after reading the title of this post. I am not crazy, well… that’s debatable. I know that temperatures are just beginning to drop and all you want to do is curl up with a nice cup of hot apple cider. Trust me; I pulled out my UGGs and knee-high socks today just because I could. But, just hear me out, because these are good. And I mean really good. Happy Fall everyone! I’m so happy that October is finally here and I get to experience it in my new city. Back home, October is my favorite month of the year. All of the best things happen during this month: leaves change color, the air gets crisp, it’s finally scarf season, and who can forget Halloween?! Where does one begin when starting a food blog? Hi, I’m Ashley and I like food. Wow, that intro sucked. I guess I’ll start with me. I just graduated from Bryant University, this past May, and moved 3,000 miles away from home, in June. 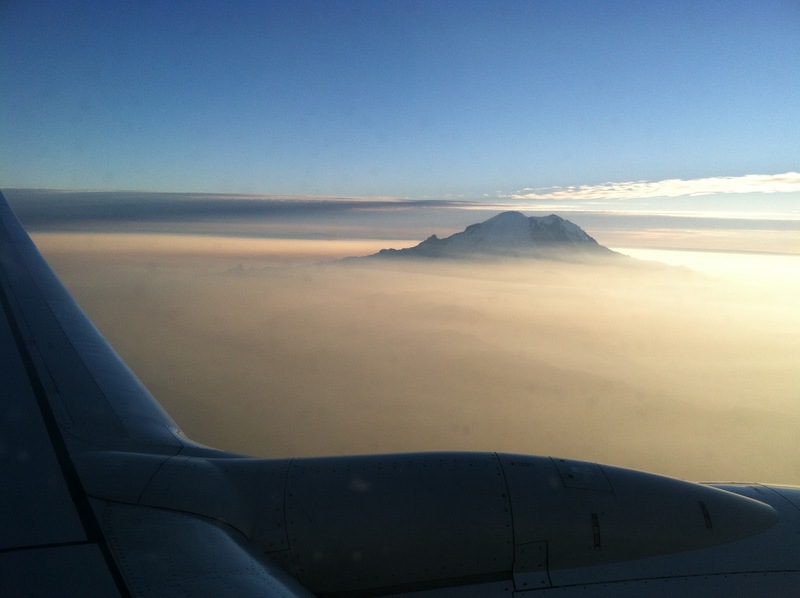 I left my family, friends, and boyfriend in Rhode Island to move across the country to Seattle, Washington. Why would someone do this, you ask? Well, I accepted a job as a National Bank Examiner for the United States Treasury. Super nerdy, I know, but I was a finance major (as if that makes it normal). Fun fact? I’m writing this from 30,000 feet in the air. Pretty cool, right? I travel a lot for work… and I guess you could say I caught the travel bug while spending a semester in Florence, Italy, my junior year in college. Ironically, it was that semester that also sparked my obsession with cooking and, let’s face it, food in general. I think we should call a truce… if you are reading this, then chances are that you are as obsessed with food as I am; so I’m going to stop feeling judged! Anyway, like I was saying, I travel a lot for work. Which on one hand is awesome, but it also means I can’t be in my kitchen as much as I’d like to. For the purposes of this blog that is not entirely bad because I had an idea. As I travel, and eat out, I’ll feature places I eat at and love. Who knows when you’ll be in Eastern Washington looking for a good bite to eat… it could happen. Let’s discuss my eating habits, shall we? That just sounded 50 shades of grey ish… Moving on, awkwardly… In all seriousness, I’m incredibly picky and weird when it comes to food. I’ve gotten A LOT better at trying things, but boy am I picky, it’s almost tiring to me. Here’s the thing: I don’t really like dairy products. I’m not one of those people who drools over a thing of string cheese (ahem… Laura, my college roommate, that was pointed at you) and I honestly haven’t drank a glass of milk in at least 15 years. My dad grew up on my grandparents’ dairy farm, so trust me I’ve been pressured to like them my whole life, I just can’t. I’m pretty sure it stems from a bad experience I had with mac and cheese as a kid. Not only do I not like the taste of dairy, but because I rarely eat it, I get sick when I do. Here’s the kicker, the huge joke in my family: one of my favorite foods is pizza. It’s not even worth trying to explain. In summary, I will do just about anything to avoid adding dairy products to dishes. I’ll tell you if a recipe called for a dairy product that I didn’t use, and you are more than welcome to throw cheese on something if you think it will taste good… I will not. I guess I should talk about my cooking experience: it’s minimal. When I was in Italy I enrolled in two cooking courses (one focused on pairing food and wine). Aside from a home economics course in high school, that’s it. I learned everything else I know (which isn’t much) from watching my parents cook. My dad loves to cook, I like to think I gained some of his genes in that aspect, but dinner was always a quick event in my house. Italy taught me how to savor food, how to appreciate food, even how to taste food (no seriously, there was a day devoted to that in class). Dinner became more than a meal for me in Italy, it was a time to appreciate your day and be with friends and family, and I Ioved that. So, that’s my goal. Aside from everything else, I want to make food more than a meal. Hopefully you like some of the stuff I try, it’ll be a bumpy road, so bear with me and maybe we can learn something together. 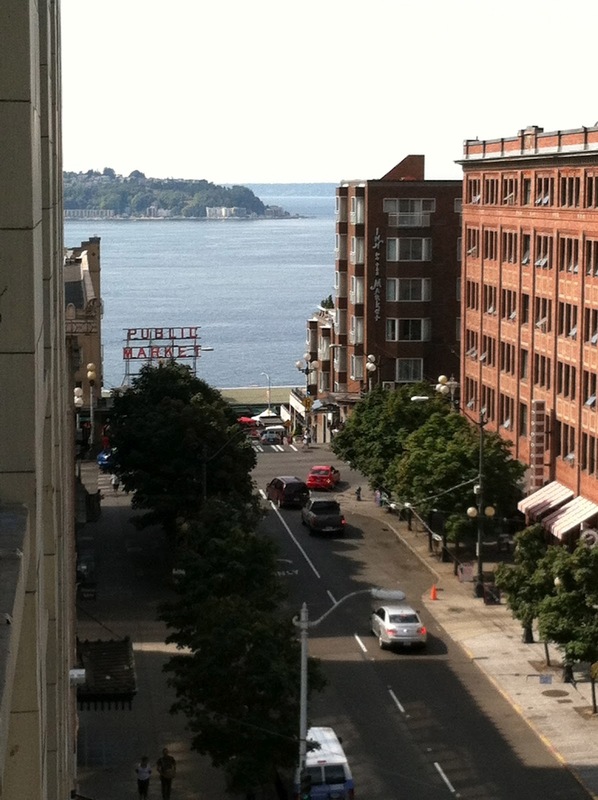 The view of the Pike Place Market out my apartment window.